In a small dish, mix together the seasonings to form a rub; rosemary, salt, pepper, and garlic. Prepare the slow cooker by placing in the liner, or spraying the sides with a non-stick cooking spray. Add in ½ cup of water. About an hour before the tenderloin is done cooking, prepare the glaze. In a small sauce pan set over a medium heat, combine the sugar, cornstarch, vinegar, water, and soy sauce. Let heat up until the ingredients are well combined and the sauce begins to thicken. DO NOT let it boil; reduce the heat if needed. Once the sauce thickens, brush it over the tenderloin 2-3 times during the last hour of cooking. When the tenderloin is done, place it on a baking sheet, spread on a little more glaze and place it in the oven, set to broil. This will help give the glaze that caramelized texture. Keep an eye on the tenderloin during this process; it may take 3-5 minutes. 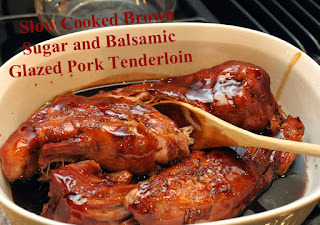 When it’s done, place the pork on a serving tray and pour over the remainder of the glaze.